It is not unusual where I live to see “love wins” decals on cars. 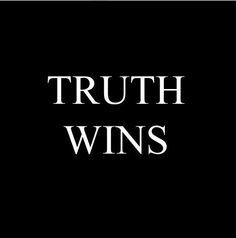 Yesterday I saw a “truth wins” decal. We talk a lot about winning. Think for a moment how often we frame things in terms of winner and losers. Why is winning so important? What do you think? Does this really need to be a competition? As a Christian, I don’t think there is a competition. For Christians truth is a person. * In one of the great ironic passages of the Bible, Pilate looks at Jesus and asks him, “What is truth?”. Poor, clueless Pilate has no idea. But equally for Christians, love is also a person. As John tells us, God is love. The Triune God is love. The Triune God is truth. Love and truth are not in competition. Love and truth are both located within the one true God. Love and truth are the expression, the result of the trinitarian relationship. And they are gifts of the one true God- to us, for us, with us. To talk about who wins is to miss the point. When we talk about truth and love we are talking about what is. We are talking about what has been. We are talking about what will be. When we talk about truth and love we are talking about God. Can you and I be mistaken about what truth or love is? Of course. And we are mistaken frequently. However our failing, our mistakes, our errors do not change the what truth and love are – in and within and as God. Part of growing in truth and love is recognizing that our concepts of truth and love are small and shallow. Our ideas of truth and love are shaped by the world we live in, our families, our societies, our experiences. Our ideas of truth and love are flawed and less than God’s manifestation of them. Sometimes, even often, knowing the truth is hard. Sometimes, even often, love is hard. Which may be why in God truth and love are intertwined and inseparable. Who could stand to know truth without also knowing love? What would love be without truth? We are given glimpses and sightings. Moments beyond words where we know truth and love. That is our experience with God, and so that ought to be our experience with each other. Truth and love intertwined and inseparable. Posted in Christianity, Ethics, God, Human, truth. Tagged love, love wins, truth, truth wins, winning. Previous: Previous post: Is there a way forward? Excellent! The truth of what you’re saying, and what has been said about God underscores the deep irony in so much of our culture.